Hampton@: FW: Join Mark Obenshain in Newport News This Thursday! FW: Join Mark Obenshain in Newport News This Thursday! With the convention is just around the corner, this is a great time to ask Mark Obenshain your questions. Subject: Join Mark Obenshain in Newport News This Thursday! Good morning. 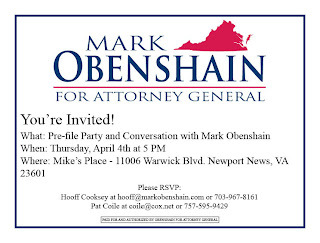 I wanted to invited you to join Mark Obenshain in Newport News this Thursday! 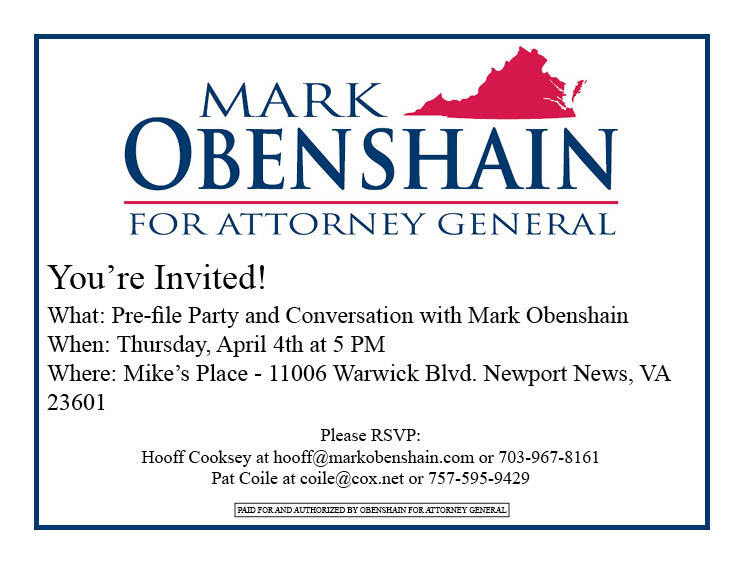 Come spend some time with Senator Obenshain Thursday, April 4th, at Mike's Place located at 11006 Warwick Blvd. Newports News, VA 23601. The event will begin at 5 PM. Please bring anyone who may be interested in attending the convention and/or in meeting Mark! It will be a great opportunity to learn more about Mark Obenshain, his campaign for Attorney General, the legislative session, and much more. We hope to see you there! Please do not hesitate to reach out with any questions you may have. P.S. For your convenience, the Newport News and Hampton Delegate Pre-file Forms are attached.